In this tutorial, we will explain how to edit attribute values on your WooCommerce store with the help of ELEX Bulk Edit Products, Prices & Attributes for WooCommerce plugin. Before getting into the step-by-step process, let’s quickly take a look at Product attributes on WooCommerce. 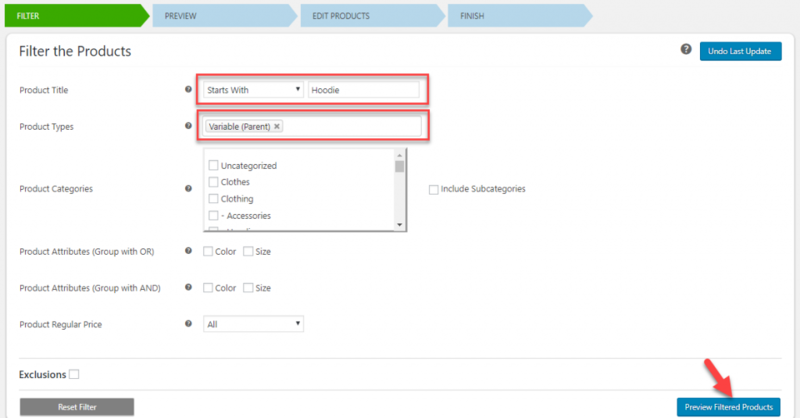 Product attributes give you the option to classify products better on your WooCommerce store. There are two fundamental uses for product attributes in a WooCommerce store. The first one is for better navigation. You can display product attributes on the frontend, so that customers will be able to filter products based on these attributes. Another use of product attributes is while creating variable products. You can find more details on WooCommerce variable products here. We will be dealing with the latter functionality while using this plugin. Let’s take an example product here, which is a variable product. It has three attribute values now – Blue, green and red (for the attribute ‘Color’. Now, imagine you got a new color in stock – Yellow. How will you add this attribute value to your product using ELEX plugin? First, open the plugin settings page, and filter the product by title. Now you can see a lot of products, including simple products and variations are filtered. In fact, because we are editing an attribute value to a variable product, you need only the parent variable product and not individual variations. So you can add another aspect to the filter. Click the Back button and modify your filters. On the ‘Product Types’ field, Select Variable (Parent) option, and click the Preview Filtered Products button. Now, you can see you have filtered only the parent variable product. This way you can filter out specific products from a large number of available products. This is one of the main advantages of the plugin. For the ease of demonstration, we are only editing one product here. In fact, you can edit more than 10000 products at a time with the help of this plugin. Click the Continue button. A pop-up is displayed asking you to confirm. Click Yes, Proceed. Now, you are on the Update screen. Scroll down to Attributes section. Select Add New Values from the drop-down menu. Select the attribute you want to update, and specify the attribute values to be added. You can also enable this new attribute value to be used for creating variations. Please note, you need to go to the product details page to create a variation on your store. Click the Update Products button. Again you will see the pop-up. Click Yes, Proceed. Now if you check the product details, you can see the attribute value ‘Yellow’ is added to the product ‘Hoodie’. Let’s see how overwrite works. Suppose you want to replace an attribute with another. For example, Red with Gray. For this, you need to choose the ‘Overwrite Existing Values’ option from the drop-down and specify the attribute values. For example, to replace Red with Gray, you have to add all the available attributes without Red. In this example, Blue, Green and Gray. Now you will see Red is replaced by the other attribute values. Similarly, you can remove an existing attribute value as well. If a particular color of product has gone out of stock, you can remove that particular variation from the store itself. For example, if you are selling red-colored t-shirts only during holiday times, you can simply add the attribute value when it is in stock. All other times, you can keep it removed. For this, simply select the attribute to remove, and click the Update button. When you want to add it back, simply choose ‘Add’ and then update the products. To explore more details about the plugin, go check out ELEX Bulk Edit Products, Prices & Attributes for WooCommerce. You can also check out other WooCommerce and WordPress plugins in ELEX. For any queries, please contact the support team.